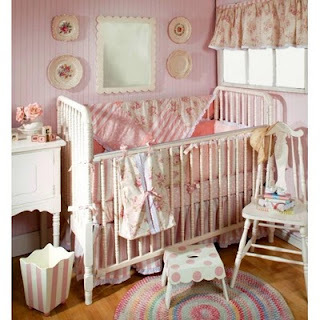 Isn't this inspiration picture from the Shabby Tea Room wonderful? 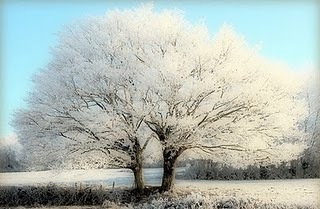 It was chosen because most of our country is in the midst of a deep freeze, and it is a beautiful capture of winter at its loveliest. I love the crisp white against the beautiful blue. Here is my submission for this week"
I'm also entering this into Really Reasonable Ribbon's Heart challenge. 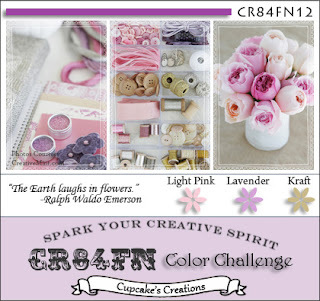 Isn't this inspiration graphic from CR84FN a lovely one! I was a little wary of using kraft with the pastels, but, as usual, after playing with the colors, I really like this combination! I'm in Florida now as a snowbird, and brought down a limited number of supplies, one of which was this vintage rose print that I printed off at home (sorry I can't remember where I snagged it). I used that as my start, and added some pearly Core'dination Amethyst cardstock, running it through my Textile embossing folder, along with the kraft card base. Thanks to Donna Mikasa, I ordered some winter white seam binding and dyed it with spun sugar mixed with some water to make it pale pink. I added a doily, the sentiment and some pale pink pearls. I think this one will be a Valentine for my parents! Thanks, Mona, for these lovely colors! I'm still making Valentines. These 2 have several things in common: the papers and the Sizzix embossed background. I'm so glad I got this folder; it works really nice for Valentine's Day cards without being too obvious. 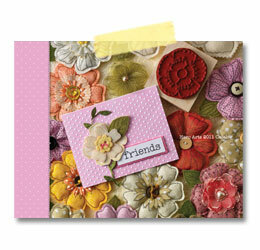 This first one uses some new Hero Arts flower stamps and a doily. The flowers were paper-pieced using my favorite ginghams and dots for both the flowers and the leaves. And this one has very little stamping. I used my scalloped heart nesties to make a negative image to pop above the gingham background, and then centered a smaller nestie heart in the center, also popping it up. The papers are some of the same used above, and I added the beautiful white lace ribbon and a tiny pearl heart. 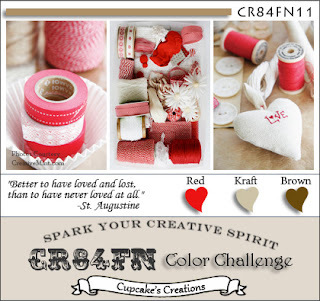 I'm entering the first one in Wee Memories "Anything Goes" challenge this week and the second one in the Really Reasonable Ribbon's Heart Theme challenge and into the Tuesday Trigger challenge at Moxie Fab World. Just had to share my joy in learning that our second grandchild was born this morning, and she's a little girl!!! Alma weighed in at 8 lbs.10 oz, and both Momma and baby are doing great! Having had 2 boys myself, a male dog, and sweet little Liam, our first grandchild, I was hoping for a girl! Here's a rerun card, that I've already shared here, but I sure had a little girl in mind while I was making it! This first one was stamped in versamark and embossed in white, framed in black, and then added to a white card base with the sentiment stamped in black. The skinny black and white gingham ribbon and script-stamped butterfly with a heart gem were added to finish. This one was stamped in versamark and embossed in a pink embossing powder, then framed in pale pink parchment cardstock, punching the edge with the hearts. The sentiment was stamped using the same embossing powder. And for the final card today, the blooming heart was stamped in black ink and colored in with pink colored pencil, framed in black, attached to a pink card base and finished with my newest sentiment set and some pink gems. Since I used pink and green, I'm also entering this into The Ribbon Girl Color Challenge #4, and because of the hearts it also fits into Really Reasonable Ribbon's challenge #16: Hearts. And also I can use this as a Valentine this year - I usually send out about 30 of them, and I'm just now starting! I started with Jennifer McGuire's technique to use an acrylic block and some water-misted fired brick distress ink to make my red background. That was overstamped in brown with the Love quote, then trimmed out and framed in dark brown cardstock. I added some beautiful ecru crochet lace (a gift from Carole), and also some stamped heart buttons hung on some tan twine. I'm also entering this into Really Reasonable Ribbon's challenge: Hearts. I've been working on a project that had a time limit, and couldn't allow myself to stamp, but the project is finished now, so I'm so glad to be making cards again! I really missed it! Only problem is that my mojo is lagging behind, after about 2 weeks off. So I kept this card simple, using this adorable Pure Innocense digital image, taking my colors from this scrap of printed paper. 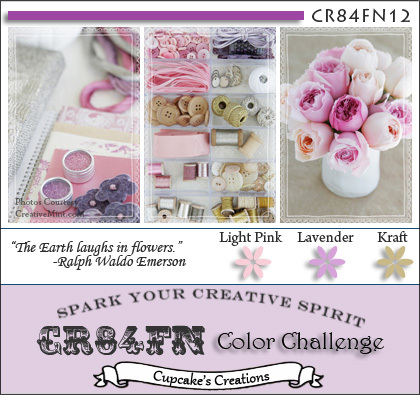 Pink and green always make me happy, and it just so happens that these are the colors chosen this week for the Ribbon Girl Color Challenge #4. Hi! Welcome to the first day of a week-long Blog Hop featuring the Hero Arts Hostesses showcasing the new 2011 Hero Arts stamps! I am so honored to be part of this group of amazing ladies. You should have arrived from the talented Kelly Booth's blog. If not, and you'd like to start at the very beginning, go to the Hero Arts Blog for a listing of all those blogs participating. I hear there will be some prizes! I've made 3 cards for you today, so let's get started. I thought it would be fun to make a clear card. The flowers from the new BLOSSOM ART set remind me a little bit of pansies, and so they were stamped on yellow and periwinkle, and the leaves on green cardstock, cut out, embossed with dots, then stacked. The acetate card was stamped with the Flourish Background. The sentiment is from a new clear set called SENDING SMILES MESSAGES. 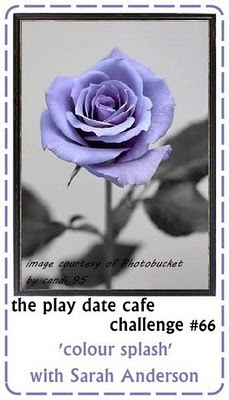 It was stamped on a die-cut embossed tag which was framed in dark periwinkle inside the front of the acetate card to hide the adhesive. This card started with my most wanted new stamp of 2011, called MUSICAL COLLAGE. It has a bird in the right hand corner, but for this card I decided to cover it with some more of the BLOSSOM ART flowers. They were stamped in brown ink on pink cardstock (and centered with a rolled rose), and the leaves, also in the set, on green cardstock. The Musical Collage was stamped in the same ink on a creamy parchment paper, and distressed lightly with victorian velvet, bundled sage, and antique linen distress inks. Then I simply added the beautiful dusty pink hand-dyed seam binding (a gift from a very special Hostess), some delicate lace, and the sentiment from last year's clear set called Just Find Me, dotted with a pink pearl. And for my final card today, I used this adorable woodblock stamp called IT'S A PARADE. It was stamped twice (to get the correct length for the card) on parchment cardstock, then framed with various designer papers and put onto a kraft card. I added the sentiment from a SparkleClear Messages set, and a heart button and twine to finish. Thank you so much for taking the time today to visit my blog. Please leave a comment because every comment left along the hop gives you a chance to win new Hero Arts 2011 stamps! Now I'll send you along to the next stop on our hop, the sweet Lisa Carroll's blog - I know she has created something wonderful for you. If you get lost along the way, or if a link doesn't work, you can always go back to the Hero Arts Blog for the master list of blog links. Also, please email tami@heroarts.com and provide the blog address that has the bad link so we can fix it. Thanks and happy hopping! 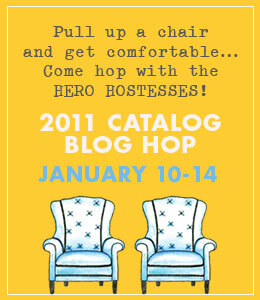 Please join me and 4 other Hostesses here on Monday, January 10, as we start a week-long blog hop showcasing the new 2011 Hero Arts stamps, and then visit the Hero Arts Blog every day next week for more of the hop! 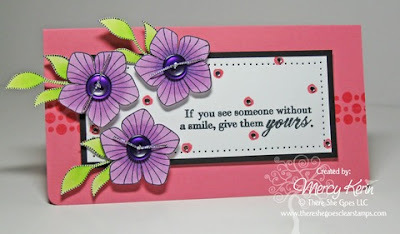 It uses the new woodblock FLOWER SWIRL VINE K5486 and also a sentiment from the new clear set SENDING SMILES MESSAGES CL490, plus several shades of Hero Hues layering papers. I knew I wanted to use this beautiful mauvy hand-dyed wrinkled ribbon from my friend Donna, so I went looking for a vintage image to pair it with. I thought this gorgeous basket of lilacs was perfect. Then I just matched up some designer papers, found some lace (a gift from Tiffany) and the rest flowed from there. Also submitting this to the Flourishes challenge: The Colors of Love, using shades of pink, white, and red, and to the Really Reasonable Ribbon challenge: Something New, being this lovely hand-dyed ribbon. I stamped the wreath 4 times, twice in Memories green ink and clear embossed, and then once in Versamark embossed in gold and again in Versamark embossed in silver. Taking these pictures at night was lots of fun. I'm adding another one just so you get the full effect. It changes as you tilt the card. I love that she used so many coordinating designer papers, something I love to do but haven't for awhile, so I couldn't wait to play. I CASED her card completely, just changing to my happy colors of pink and green, and using a digital Pure Innocence image from Heather Ellis. Isn't she sweet? Hi everyone! Hope you're having a good day - we're having some fluffy snowflakes coming down, but it doesn't appear to be accumulating very fast, so I'm just enjoying the show! 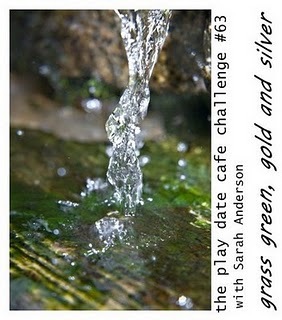 This card was made for 4 challenges; first for the The Moxie Fab World Tuesday Trigger, shown here. Gorgeous, huh? It also qualifies for the Clean and Simple challenge from Paper Play, for the New Beginnings challenge at Simon Says Stamp, and for Really Reasonable Ribbon's Something New challenge (mine is my new Nesties Labels Four). 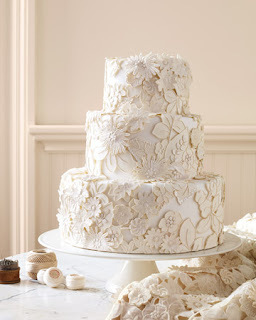 I chose 2 cardstocks, one a solid ivory (card base and tag) and the other a creamy parchment (background panel). I stamped the lace background in Versamark on the parchment, and embossed it with Ranger's Embossing Pearl in silver. It doesn't appear silver at all to me, but it does give a lovely pearl shimmer. Next I stamped my sentiment using antique linen distress ink, and then stamped versamark over the entire label and heat embossed with more of the pearl embossing powder. Here's a closeup to show you the lovely pearliness - I think I've found a new favorite embossing powder! I finished by adding some ivory pearls, an ivory ribbon and a bow tied with a button topped with a larger ivory pearl. Made for the January challenge at Hero Arts and also for Simon Says Stamp and Show challenge: Show us your new stamps, and for the Flourishes Timeless Tuesday challenge: Flowers. I think the cover of the 2011 Hero Arts catalog is one of the prettiest yet, so I made my own version, using 2 new clear stamp sets from it. I used distress inks to color the flowers. The flowers and leaves from this set were stamped on various colored cardstocks, and distressed with some fired brick distress ink. 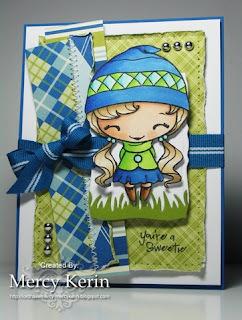 The aqua background was embossed with a Sizzix embossing folder and sanded, then it was layered with a My Mind's eye striped dp, some lace and the sentiment from another new clear Hero Arts set called Sending Smiles Messages. 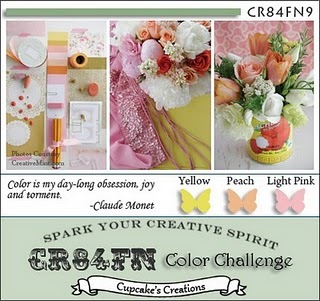 Also adding this to the Flourishes Timeless Tuesday challenge: Flowers. 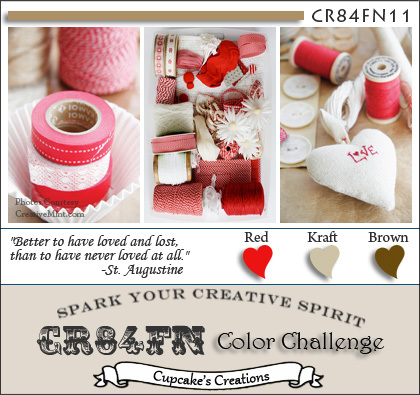 A new color challenge for the new year! Birds and Swirls was embossed on pale pink cardstock for the base of the card, and sanded. The main image is called Butterfly Field, stamped in 3 shades of distress inks: worn lipstick, spiced marmalade, and mustard seed, then cut with a nesties scalloped circle die, and framed with a doily. The beautiful hand-dyed seam binding is a gift from my sweet friend Donna, centered with a PTI button. I added a butterfly and a smaller scalloped circle for the sentiment. I'm also entering this into the Really Reasonable Ribbon challenge: Something New - that would be this lovely hand-dyed ribbon/seam binding! These fabrics are some of my favorite scraps from a pink and green quilt I made a few years ago. I pieced a tiny quilt, cut out a Stampin Up Top Note label shape, and zig-zagged it to the creamy parchment paper backing, adding some lace and the teeny buttons. The sentiment was stamped on the oval label and secured by some organza ribbon. I felt all it needed was these tiny rolled roses, made from BoBunny Tutu Dot. I spent a happy afternoon putting this together, and if we happen to get another sweet Liam (our first grandson), then that's just fine, too. I'll keep you updated!